After a few years of dating, we went on Christmas vacation to Orlando, Florida with Sean’s family and a group of his family’s friends. We were having a casual, relaxed week in the sun, so it came as a surprise when, over New Year’s dinner, Sean got up to make a formal speech. Well, it turns out that he wasn’t just making a speech – he was proposing! I had absolutely no idea he was planning to pop the question, and of course (after catching my breath), happily accepted! Once we returned from holidays, our wedding planning began right away. I had seen photos of St. Marys Golf & Country Club on Facebook, immediately fell in love, and knew that I needed to book an appointment to see the venue in person. We had visited one other venue, but it didn’t even come close in comparison to the feeling we got when we walked into the Ballroom – we knew that it was where we were meant to have our wedding! Although, it wasn’t just the room that sold us. Ashton (Director of Special Events at SMGCC) was amazing! She was so accommodating of our requests, graciously answered every question and concern we had, was so organized, recommended all of the other incredible vendors we worked with, and truly helped us feel at ease through the entire planning process. After our venue and date were secured, we started working through the details. 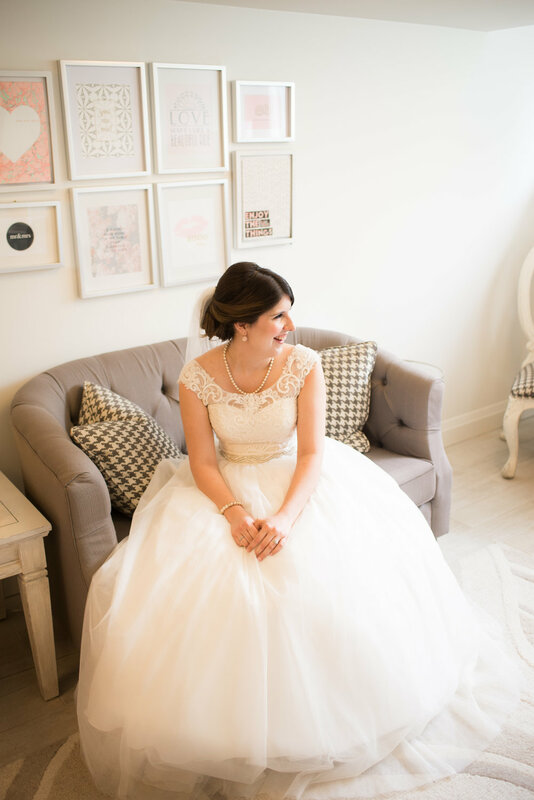 I turned to David’s Bridal to find my wedding dress, and knew from the moment I stepped into my tulle and lace ballgown that I had found the dress. I instantly felt like a bride, especially when I walked out of the change room and caused a floodgate of happy tears from my bridal entourage. We chose Above & Beyond Event Design for our décor, Lyric Flowers for our florals, Nina Polidoro for our photography, Music Central Entertainment for our DJ services, and All Dolled Up for the girls’ makeup. It blew us away how well all the vendors worked together, and how effortlessly their teamwork brought our vision to life. To create a formal look that was both modern and feminine, Above & Beyond used crystal chandeliers, mirrored stands, flowing drapery on both the ceremony pergola and reception backdrop, satins in ivory and blush, sequins in navy blue, and gold accents like candle holders and flower vessels. Lyric Flowers used white and lavendar roses, elevated with pops of greenery, to create a polished garden feel that was exactly what we had wanted, but could have never explained – it was all perfect. And then Nina captured the whole day in such a way that we will never forget a single moment. I would recommend her to every single person I know, and will be using her services for every single photo opportunity our life will present. Aside from the gorgeous setting and details, what stands out most to me from our wedding day was four key things. First were our vows. Even though we were standing up in front of all of our family and friends when we became husband and wife, it honestly felt like just the two of us. It was such an amazing, intimate moment between us that I will never forget. Second, I loved spending the morning getting ready in the Bridal Suite with my bridesmaids. We took our time, relaxed, chatted, and just enjoyed the day. And then there were all the little things that SMGCC did to make me feel special, which weren’t really that little after all. Ashton and her team took the time to personalize signs in the Bridal Suite and throughout the event space, checked in on me several times throughout the day, and reminded me to take it all in before walking down the aisle, and these little touches did not go unnoticed. Lastly, we were married exactly five years to the day that we met, and we realized this on our wedding day! (Oh, and I can’t forget the food prepared by Chef Jason. SO good! That is definitely another highlight of our wedding). At the end of day, we wanted the focus of our wedding to be on having fun, and that is exactly what our guests (and we) did! Everything felt so relaxed and stress-free. There is not one thing I can think of that went wrong, and I know I have St. Marys Golf & Country Club to thank for that. They made sure we just enjoyed our day, and didn’t have to deal with any of the details or concerns. It was truly one of the best days of our lives, and if we could do it all over again, we wouldn’t change a single thing - except maybe that we’d have our brand new baby girl in attendance (due February 2018)!